In case you’ve not noticed, soon it will be Christmas; that most wonderful time of the year! A time to relax, be merry, deck the halls! 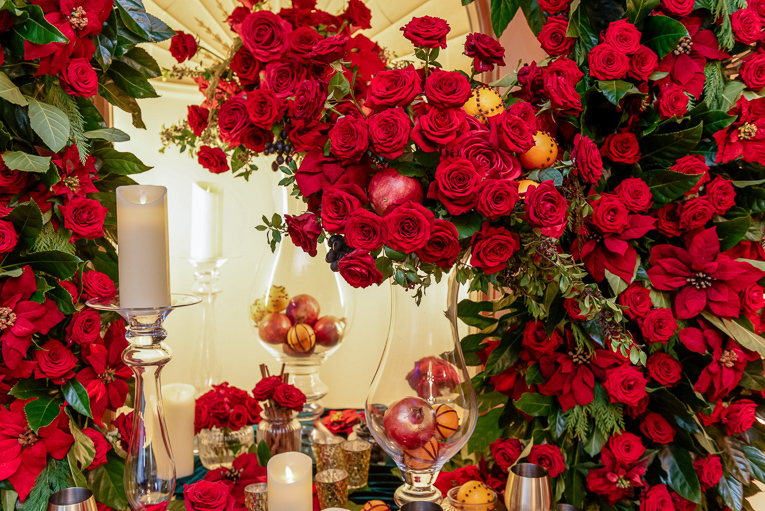 With social media awash with images of the perfect Christmas, from opulent flower walls to entire buildings covered in decoration, you may be forgiven for thinking that to create a Wow, you must GO BIG! Of course, insta-images of 12 foot high Christmas trees swamped in bows, candles and glitz create a real impact, but, as a rule, at Hybrid we abide by the “less is more” adage; we believe that the essence of Christmas can still be captured using a few, well chosen, beautifully styled flowers rather than a tonne of sparkly birch trees. 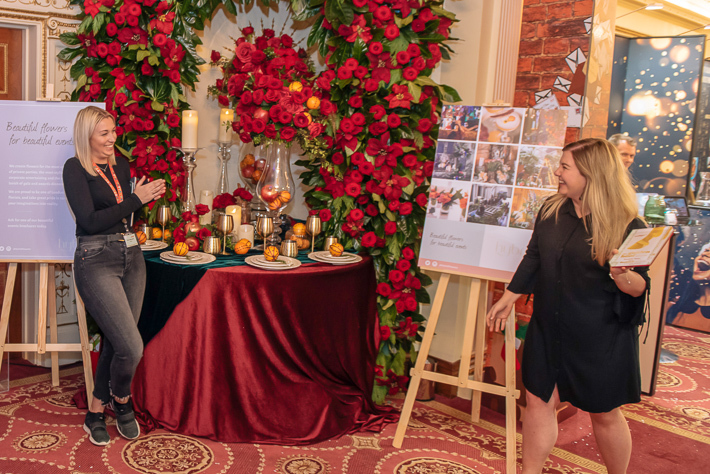 For our designs at this year’s London Christmas Party Show we were asked to create a design within an alcove at the largest Livery Hall in London, Plaisterers’ Hall, which backs on to the remains of the original Roman London Wall. In this unique venue, we wanted to create a lush Christmas atmosphere without going too over the top; we wanted the warmth, the magic and the feel of Christmas but didn’t want to chuck glitter at everything. To achieve this, we decided to go back to basics and asked ourselves what is the essence of Christmas? What are the most Christmassy colours, scents, textures around, and which little touches can we add to our design to make people feel the magic of Christmas? 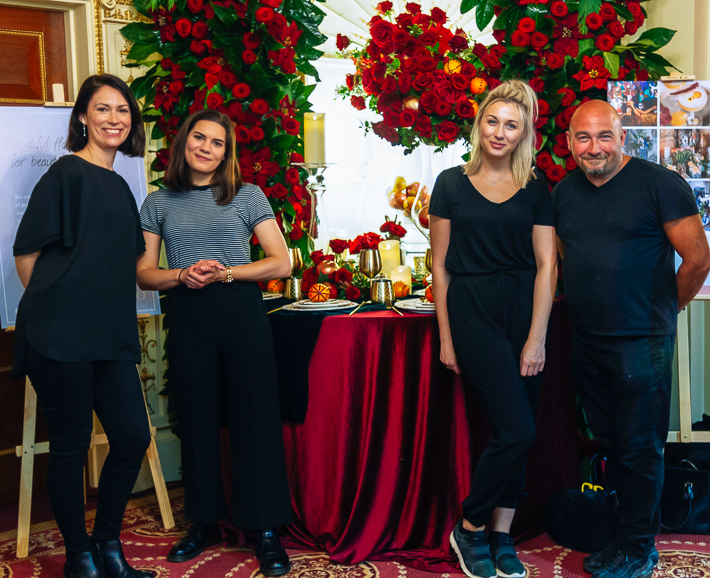 We challenged ourselves to create a timeless design that would be in-keeping with a Christmas scene from when the original Plaisterers’ Hall, was built back in 1556, as well as combining the essence and spirit of a contemporary 2018 Christmas. Our solution: a colour scheme of red, amber, gold and emerald green mixed with velvety textures and lots of shiny things. And so we set about creating a bit of an optical illusion within our curved alcove. Appearing as if a rounded table was set into the wall (when really it was half a table making the most of the deep curved alcove behind) we filled the space with lots of Christmassy details. 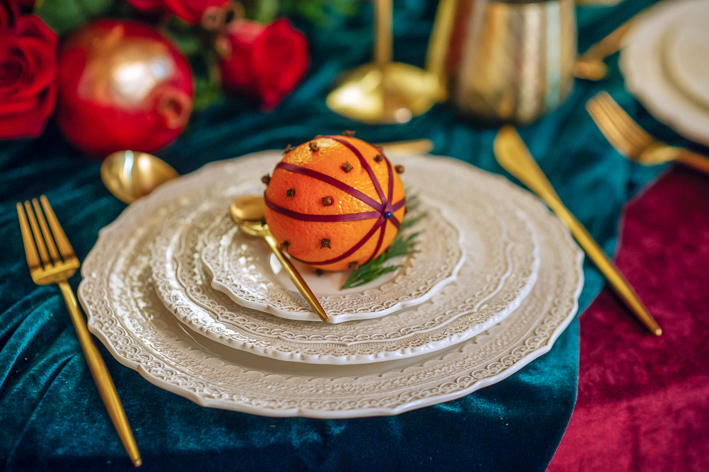 We used two different textured velvet cloths sourced from our friends at Borovick Fabrics in Soho and a beautiful lace edged chargers. 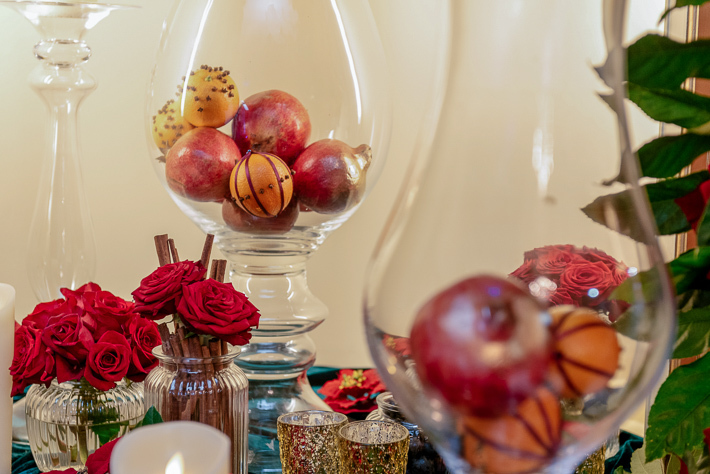 We used brushed gold cutlery, tumblers and goblets and added beautiful, rich, warm coloured fruits like pomegranates, oranges and grapes. And of course, no Christmas table would be complete without a scattering of cinnamon sticks and candlelight. 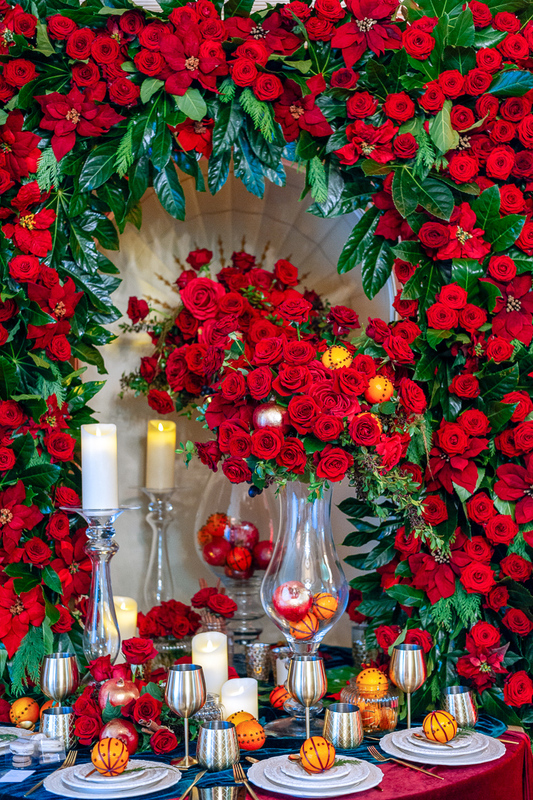 Our key flowers were scarlet coloured roses, opened to perfection, combined with traditional poinsettia flowers and glossy green foliages. Bearing in mind our “less is more” philosophy, the next question we asked ourselves was quantity: we knew these lovely festive details would speak for themselves but what if – What If – we went BIG, just this once? We ‘ummed’ and ‘ahhed’ for all of 5 minutes before deciding that whilst a smattering of Christmas details would hit the festive spot perfectly well, should we not throw caution to the wind and really indulge in the joy of Christmas? And with that, we were off! We ordered ourselves not one, but two types of velvet red rose, ‘Red Naomi’ and ‘Freedom’ which we set amidst the shiniest, deepest green aralia leaves we could find, contrasted with touches of Cupressus foliage and combined with the most beautiful faux silk poinsettias. 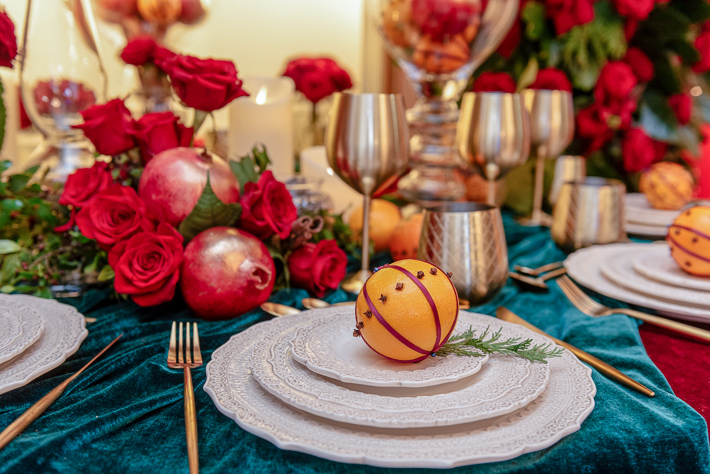 There was no holding back as we sprayed pomegranates gold and studded the oranges with different patterns of cloves, finished off with a red ribbon. 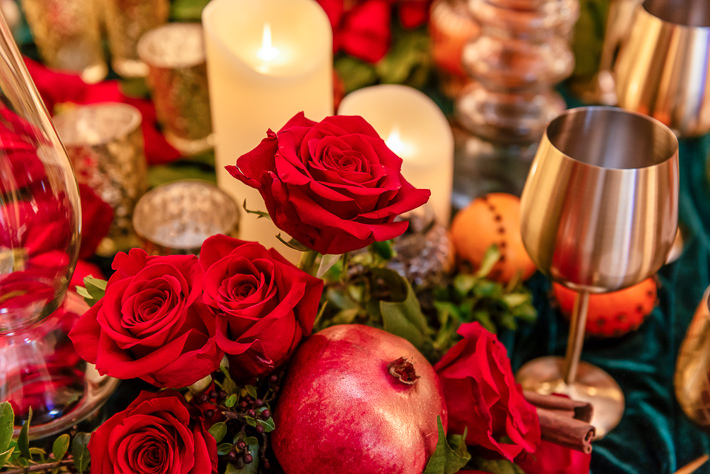 And what Christmas table isn’t complete without a full-on floral arch full of red flowers and winter foliage completely surrounding the festive setting?! Looking back, we feel a little giddy! Those glass-urns, the goblets, That Arch! All adorned, stuffed, embellished with hundreds of breathtakingly beautiful roses. Was our flirtation with opulence worth it? Well! 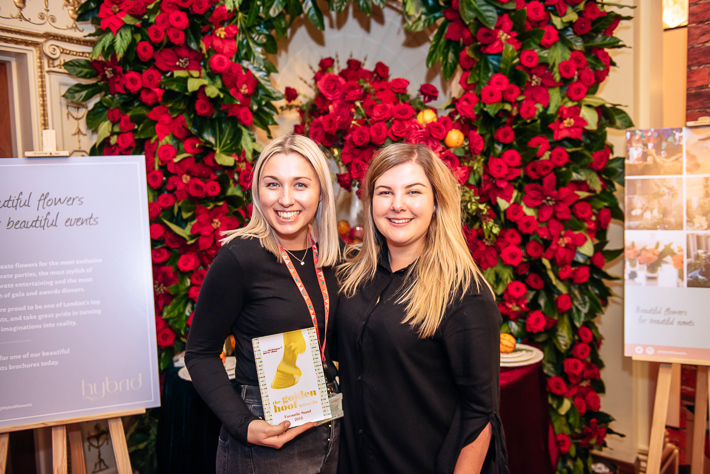 We think it might have been, especially as we won the award for Best Stand was as voted by the visitors (a delightful surprise). 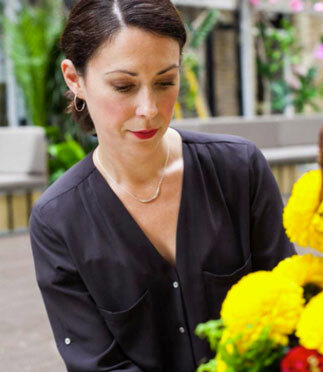 Use red, sparingly, in the same way as a movie star may use a dash of scarlet lipstick, to create a hint of glamour and colour without drenching the senses. 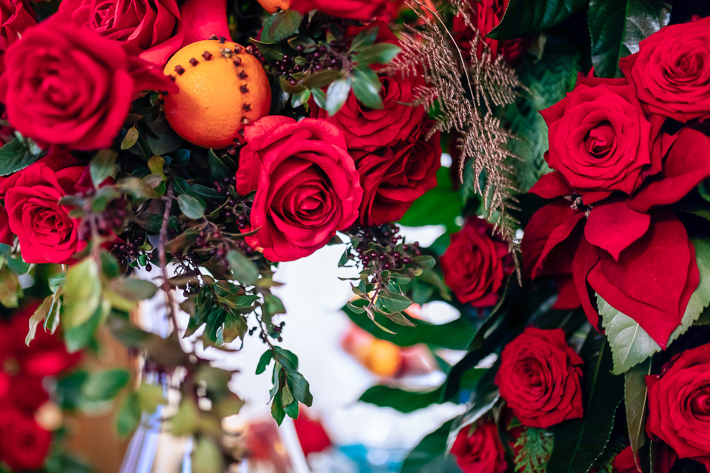 To do this, you must find the most vivid red flowers you can afford, but here, less is definitely more, don’t get too many: roses or poinsettia plants are perfect (you can cut poinsettia flowers and place in vases of water for a more delicate look). Combine with green shiny and textured foliage. Deep green glossy leaves, such as evergreen camellia, laurel or aralia leaves from a garden are perfect, and combine these with common or garden stems of conifer (yes, we said conifer!) or, if you are bit posh, stems of rosemary. Add a touch of Gold: buy yourself a can of gold spray paint and spray pots, tumblers, little vases or candleholders deep, rich opulent gold (pears also look gorgeous touched, but not completely covered, with gold). And last but never least, our most favourite Christmas decoration of all time will always be clove studded oranges. They. Are. A. Must. Easy to create and heavenly to smell.